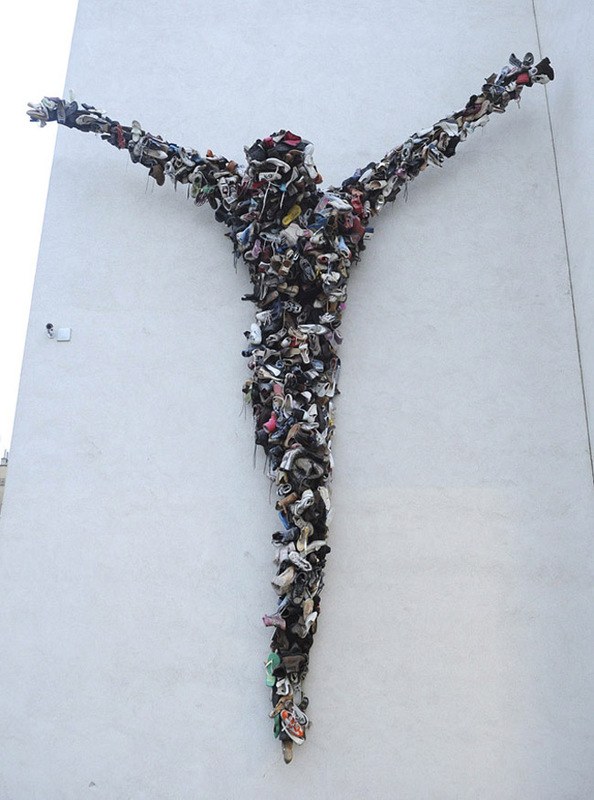 Continuing with the shoe theme (see previous post) this sculpture titled Shoe Christ: Compulsion to Refuse Something that Has Been Used is made by Czech artist Petr Motycka using approximately 1444 used shoes and sneakers. Measuring more than 6 meters high and weighing over 500kg, Shoe Christ was originally created for a public space on Prague’s riverside (see bottom photo) where it was shown last year. More recently, it was modified and displayed at the DOX Centre for Contemporary Art where it has been since the end of last January. The fact that the sculpture is made of shoes that had been used is very important. 1444 worn shoes means that more than 1400 people and their stories are part of the Shoe Christ. Used things and especially shoes often evoke repulsion. There are not many people who buy second hand shoes, who want to wear shoes that have been worn by someone else. Shoes are a very personal property. Photos courtesy of EPA/Filip Singer, DOX, and serdzoid’s flickr. This entry was posted in Art, Pop Culture, Street Art. Bookmark the permalink.